Welcome to our best electric violins reviews: our look at what we think are some of the finest electric / silent violins on the market for a truly virtuoso performance. Electric violins have a few distinct advantages over their traditional acoustic counterparts. Firstly, electric violins are often referred to as silent violins. This is because when not plugged into an amplifier they are completely silent. Most of these violins also come with a headphone socket, allowing you to plug in a headset and listen to yourself play in privacy. This is particularly useful when you need to practice without disturbing others, or you would just rather not let others hear you play until you have perfected your performance. Electric violins are also great for public performances by plugging them into an amplifier. Acoustic violins suffer in this area because you tend to get feed back when you amplify them. Lastly, electric violins just look cool compared to acoustic violins. So with that thought, let’s dig into our best electric violins reviews. ✅ In a Hurry? Check out this side-by-side comparison of our best electric violins reviews on This Special Page, and see up to date prices and pictures. For our best electric violins reviews we have picked out a selection of the most popular models on the market today. Some of these violins fall within a budget that should be easily affordable to most people. However, a few of the violins you find here are at the higher more premium end of the scale, and offer premium build and workmanship to go with it. Here is the list of the electric violins we have reviewed, and you can get full details including price and availability using the links here. Alternatively just scroll down to read what we think of these violins in more detail. 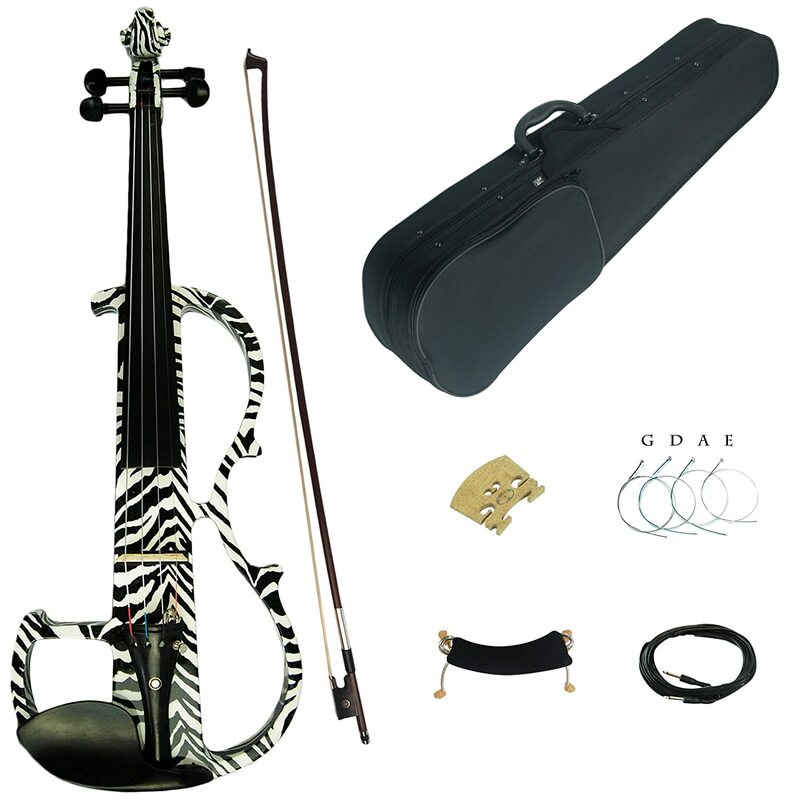 The Cecilio 4/4 CEVN is currently the #1 best selling electric violin on Amazon and other online stores. This is largely due to how Cecilio have crafted an instrument that is of surprisingly high quality considering the very reasonable price they are currently on offer for. This Cecilio electric violin is a superb choice for anyone new to the instrument, and is also a perfect for more experienced players. The violin is currently available in the 4/4 full size, as well as a 3/4 option which is slightly smaller. You can read more about the Cecilio electric violin sizes through this link. The Cecilio is hand carved from solid maple with an ebony fingerboard, and the ebony frogged bow is made from genuine Mongolian horsehair. Included in this set you will also find a durable nylon lined hard shell case, rosin, bridge, amplifier cable, headphones and a 9V battery to keep it powered up. All in all the Cecilio 4/4 CEVN is perfect for beginners and a good choice for advanced violinists who want a good instrument at an affordable price. ✅ For full details and all color options on the Cecilio 4/4 CEVN Click Here Now, and see what other buyers think of this great instrument. For the many left-handed violinists out there, Cecilio also make a left handed electric violin of this exact same model. It is exactly the same as the violin we looked at above and is available in the same range of colors, but is made to be played left-handed. If you’re a left hander looking to play the electric violin, the Cecilio left-handed violin is highly recommended. The Bunnel Edge is another full size 4/4 electric violin that is currently garnering a ton of rave reviews on sites like Amazon. This beautifully made instrument’s stunning design is matched only by the stunning sounds you will soon be pruducing as soon as you open the case. This is thanks to the violin’s setup and finishing touches that are performed by a team of professional luthiers before being shipped. The Bunnel Edge electric violin is hand made from solid maple wood with ebony fittings, and the bow is made from high quality Brazil wood with Mongolian horsehair. 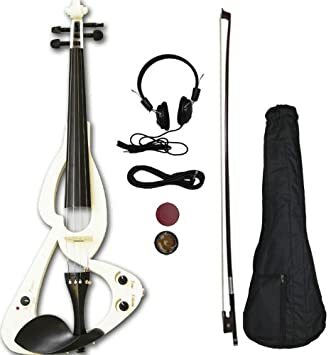 Also included with this highly rated electric violin is a full carrying case with strap, as well as headphones, a powerful mini-amplifier, rosin, cables, 9V battery and polishing cloth. We think you will find that the Bunnel Edge electric violin offers a premium quality experience that both beginners and professionals will appreciate, but at an affordable price. ✅ The Bunnel Edge electric violin is currently available in two stunning color choices – Bombshell Blue and Rock Star Red. Click the links for more details. Electric violins do vary in price range – from those under $300 that are perfect for beginners and practicing, to higher end models that are designed for stage performances. Our best electric violins reviews features models at both ends of the price spectrum, but you should always check with retailers for up to date prices. You might even find a great violin offered on a special deal! You can compare the current prices of the violins we have featured plus a few more on This Special Page. The YEV105BL is a 5-string offering from Yamaha that is designed to be easily accessible, especially if you are crossing over from using a traditional violin. 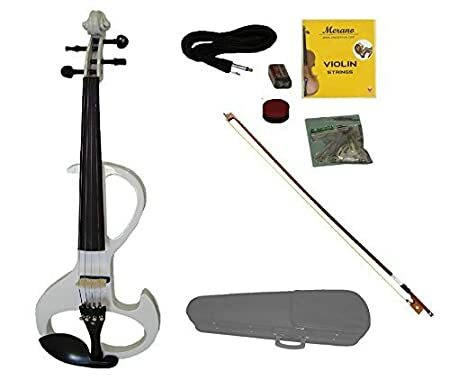 What you are getting with this carefully crafted instrument is a no frills electric violin that relies purely on quality craftsmanship rather than any fancy add-ons. This truly elegant Yamaha electric violin is constructed using a layered combination of maple, mahogany, spruce, rosewood, ebony and walnut to give it an exquisitely premium feel and look. The violin requires no batteries to operate, because the passive electronics of the Yamaha YEV105BL mean it relies on the natural resonance of the construction and the dual-piezo pickup. This Yamaha electric violin is truly a performance instrument at its heart, and this is where the superior construction quality really shines. Simply plug the violin into an amplifier and you are ready to leave you audience dazzled. The Yamaha YEV105BL is a 5-string violin, compared to the usual 4-string you would normally expect to find. Although the price of this violin is certainly not for those on a tight budget, the quality of the materials and construction do make the Yamaha YEV105BL well worth a look for any experienced violinist. ✅ If the 5-string option looks a little daunting you will be glad to hear that this Yamaha electric violin also comes in a 4-string version: Yamaha YEV104BL Electric Violin. Alternatively you can see the Yamaha YEV105BL if you want the 5-string violin. There are a few NS Design Electric Violin models on the market right now, but the CR4 is currently their flagship instrument here. Legendary instrument designer Ned Steinberger is the brains behind all NS Design’s instruments, and with the CR4 electric violin they have produced a high end piece of truly remarkable quality. The first thing you notice about the CR4 is its strikingly unorthodox appearance. Don’t let that fool you though, because if you close your eyes you might believe you were actually listening to an acoustic violin. This is thanks to the polar pickup system and active electronics that allow you select an acoustic tone, an electric tone, or a pizzicato tone. Another outstanding feature of the CR4 is the combination of the adjustable chin rest and shoulder rest, which will probably give you the most comfortable playing experience ever. 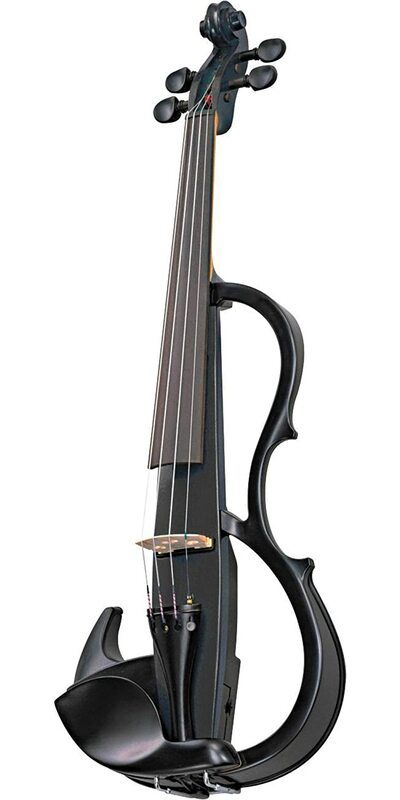 The NS Design CR4 electric violin is made from solid maple with a hand graduated ebony fingerboard. Although the design of the CR4 electric violin is begging for it to be played in public, you can also practice at home in silence thanks to the 1/8 inch headphone jack. If you want a truly outstanding looking and sounding electric violin, the NS Design CR4 is the perfect choice. ✅ Ready to let the CR4 by NS Design help you stand out fro the crowd? See full details on the CR4 Electric Violin, or compare it with other violins Here. Thanks for taking a look at our best electric violins reviews – we hope you found it useful. Of course the violins above are just are just a small selection of what is currently available.